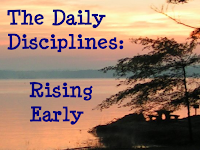 The daily discipline we want to discuss this week is that of rising early. In my opinion, rising early is one of the best ways to maintain a disciplined life and diligently accomplish all the daily things you need to do. Of course, it's not foolproof, but I've found that those extra few hours in the morning give one a great way to jump-start the day and get more things done.. The exact time that each determines as "early" will differ with almost everyone. For me, it's 6 a.m. For others, it may be earlier or later. The important thing is that you work your schedule out so that you get enough sleep, because being sleep deprived and exhausted all the time definitely won't help you work very diligently! Eight hours is the amount of sleep I aim for each night, though sometimes it's a little less, and sometimes it's more when I sleep in to catch up. Each person is different, and some people require more or less sleep, so try to find your own balance. Eight hours a night is usually a good place to start if possible. Of course, being able to rise early usually depends on how late you go to bed - we'll talk about this discipline next week! Once you determine your rising time, work your schedule out and try to stick to it! Being consistent with rising early will help you get up a lot easier when your alarm goes off in the morning. If you only do it sporadically, you'll find it hard to drag yourself out of bed. The first few days of getting up at an earlier time will probably be pretty hard. However, if you keep at it, you'll find yourself feeling refreshed when you wake up, and you may even find yourself waking up before your alarm or at the same time even if you don't set your alarm! Getting up early should not be something you legalistically force yourself to do, however. Sometimes you need to catch up on rest, or if you stay up really late (often due to circumstances you can't control) it can be unwise to make yourself get up early. Ironically, today I'm writing about getting up early, but I actually slept in this morning until 8:30 a.m. I thought I'd set my alarm, but I guess I didn't, for it never went off... And after a very tiring week full of late nights, it was nice to get a little more rest. It can be hard to find the balance between actually needing more rest and just being lazy and wanting more sleep, and it will sometimes be something you'll need to determine day-by-day. However, as a general rule, you'll want to try to get up at a set time. Weekends can be a different story, for some people at least. I usually don't set my alarm on the weekends unless I have something I need to do at a certain time, and if I do, it's often later, for 7 or 8 a.m. Although I'd like to get up at a consistent time each and every day, I usually find that the weekends are a good time to catch up on rest I missed during the week, and because I tend to stay up later on the weekends, it's often wise to rise a little later as well. What does the Bible say about getting up in the morning? Proverbs is full of verses rebuking the sluggard, and promising poverty in return for laziness. However, Psalm 127:2 tells us that "In vain you rise early and stay up late, toiling for food to eat - for He grants sleep to those He loves." We need to remember this and not force ourselves to work too hard and deprive ourselves of sleep, for God made us to need sleep, and it is one way our dependence on Him is displayed. He grants us sleep. Quite a few Psalms talk about the dawn, and if you live in a place where you can see the sunrise (unfortunately, if our valley, it's impossible to see it because of the trees) the anticipation of seeing the sun rise beautifully can help you get up. A verse you may want to remind yourself of as you get up each morning is Psalm 118:24 - "This is the day the LORD has made; let us rejoice and be glad in it." So, we know that it's good to get up early, but how do we make ourselves get out of bed and start on the day? For me, telling myself that I need to get up and reminding myself that I feel bad if I don't get up often works. Mentally reviewing what I need to do that day usually gives me motivation to get up and sometimes excitement at what I'm doing that day will help me bounce out of bed. Usually just taking the first step and getting out of bed will make you feel awake and ready to get up. If you lie in bed sleepily telling yourselves excuses to sleep in, you'll usually end up going back to sleep. Another thing that helps me is that as soon as the alarm goes off, I reach up and turn it off, then immediately turn on my lamp. The light shining in my eyes will make me more prone to get out of bed. Some people put their alarm clock across the room so that they have to get up to turn it off. After all, once you're out of bed, you're much less likely to get back in! As we talked about last week, not doing your devotions or reading in bed soon after you get up will also make you feel more awake and not prone to go back to sleep. Developing a morning routine will also help you stay awake. For me, it's doing devotions right after I get up, then getting dressed and showering every-other-day, perhaps picking blueberries, then eating breakfast. Others may want to take a shower or get dressed as soon as you get up, or at least wash your face, for there's nothing like water hitting your face to get the sleep out of your eyes. Whatever you do, try to discipline yourself to have a pretty consistent rising time each day, or at least each week day. You'd be amazed at how much more you get done and how your body will adjust and you'll be awake and prepared to greet each day! Please share your ideas with us! Feel free to answer all, any, or none of the below questions, but leave a comment and let us know your thoughts on rising early! When do you usually try to get up? Or, what is your ideal rising time? What do you do to make yourself get out of bed? How do you make yourself stay awake? Do you have a morning routine? Does it help? I agree. I used to wake up at 4:30 every morning, but I have gotten lazy over the past few weeks. # When do you usually try to get up? Or, what is your ideal rising time? I try to get up at 7.00. But my ideal rising time would be 6.00. But we've been so busy lately...thats not possible! # What do you do to make yourself get out of bed? # How do you make yourself stay awake? Usually once I start reading my Bible 1st thing in the morning my eyes slowly get less tired. # Do you have a morning routine? Does it help? No not really! I really appreciate your blog! I think this is the 1st time I've commented but I have been visiting for a while. I am terrible at this. It seems like first thing in the morning, I can't think straight enough to convince myself out of bed. But this was encouraging. maybe I will try harder this week. 6am is my usual time for getting up. But for the past couple days I have been lazy. I usually think about how I can bless my parents, that helps me get up. Making a pot of coffee or tea, cleaning up their desks etc. I splash COOL water on my face for a full 2 minutes. You will not BELIEVE how this works. It wakes me right up! And make myself tea. Get up, get dressed, wash face, brush teeth, personal Bible study, home blessing, BREAKFAST! Oh, boy....I am not a morning person. My alarm goes off at 6:30. Sometimes I am faithful to get up, but most of the days, it is 7:00...not to bad, I guess. However, with the hope of being a wife and mother someday, I should try to be better. IN Proverbs 31, she rises early! Great post Anna! I love getting up early, and I try to be up by 6. What helped me become disciplined in this area was the accountability I had with my dad. Every morning we used to walk around the lake near our house at 7:30, so I always had to be up early and ready to go. Nowadays we've been walking at night, but the early morning habit is one I will always keep. It's in the morning when my mind is the freshest and when I do my best writing! Thanks to all you girls for sharing your tips and rising times! Zoe: Wow! 4:30 a.m. sounds really early! When do you go to bed? Samantha: Having a morning routine is good. Yours sounds great! Julia: Thanks for answering the questions and for commenting for the first time! Laura: Keep trying and it will get easier, somewhat! Sloan: Washing your face for two minutes definitely sounds as though it would chase away any sleep! Ella: I'm not really a morning person either, and 7 a.m. isn't bad. I don't particularly like getting up in the morning, but I like having gotten up after the fact! Tiffani: Yes, stretching helps as well - I'd forgotten to mention that! Amanda: Accountability helps me as well, and I plan to devote an entire post to it. I really enjoy how the early morning feels, for especially in the summer, it's the only truly cool time! I usually get up about 9, because I need more sleep than most people. I'm Orthodox Christian, so after making myself wake up enough I stand and say the Morning Prayers - set prayers that include praise to God, prayer for forgiveness, the Lord's Prayer, prayer for strength and guidance in the day, and often the Nicene Creed and some Scripture readings (one each from the Gospels and Epistles - if we do this every day we read through the whole New Testament in a year, plus any Old Testament readings we do) then end in my own personal prayers. I am not a morning person at all. My mind is so much clearer in the afternoon/evening. My ideal rising time is 10. I know that may sound appaling to some, but as I said - I'm not a morning person. If I get up at 6 I'm useless until 10 anyway. I accomplish so much more at 2 o'clock in the morning than at 6. # Do you have a morning routine? Does it help? But my goal for this fall will be six a.m. If I want to get up at six, I set my alarm at 5:55, so I have five minutes to lay in bed before getting up. Usually just getting up wakes me up. I actually feel more tired throughout the day if I sleep in than when I just get up. Ouch! A post on getting up early! I love having a set time to get up, and I get so much more done when I do. In my family, we are all night owls, so it is an uphill battle. My ideal time to get up is 7:00, but in reality I get up about an hour and a half before I need to be somewhere. That means it is anywhere from 6:30 to 10:00. That is a wide range, and I am trying to make a more consistent habit. My schedule is changing so fast, and it is different every day. I tend to do more at night, but I am more diligent when I am up early -- if that makes any sense. I usually wash my face first thing. That helps some, but by then the battle is already over for me. I have put my alarm clock where I have to leap out of bed to turn it off, but that usually only makes my bed look more inviting, so I tend to lay down again for at least a minute or two. That can be dangerous, so I am trying to work on that. Great post. I am looking forward to the one about getting to bed! I get up at 4:45am if I'm heading to morning shift, at 7am if I have morning lectures and at 10am if there are no lectures but there is a night shift to go. It is same in weekends. When I was at high school and upper secondary school I had to wake up immediately when the alarm started make noise (horrible noise, that one). If I didn't, I missed the bus and because we lived in countryside, there was no other later bus to catch up. We have our driver's license when we are 18yo and our parents went working before we got up, so it was up to us to get up and go to school on time by bus. Nowadays I still get up straight away and in winter time put on my bright light therapy lamp, then I eat something, go out with dogs and after that I walk to university/work. It's not hard for me to stay awake once I have opened my eyes. I can also easily work even if I have some sleep loss. I am not a morning person, my family often say that I should live in New Zealand. There my day and night cycle would be correct :) I tend to sleep late whenever I can and because of my work, I can't go to bed same time every night. I am also a bit grumpy in the morning so I need some time just for myself before I can interact with other people. I'm not native English speaker, forgive me my spelling errors :) Prepositions are my Achilles' heel in English, I always mess up with them. Kyriaki: You're right in saying that you are managing with your means and giving glory to God for that! It's important to take care of your health, and though your schedule won't be like others (but everyone is different!) it's good to get enough sleep and give glory to God! Maria Pauline: Vacation does change things, that's for sure! If I'm on vacation, I rarely set alarms unless we need to be somewhere at a certain time. It's a good time to rest and recuperate from the busy pace of life! Elizabeth: I understand where you're coming from! Believe it or not, I am much more of a night owl than a morning person. My dad teases me that I'm a night owl that wants to be an early bird. =) I too can get so much done at night, but seemingly more if I get up early. Contradictory, I now! Mirka: Thanks for commenting and sharing your interesting schedule! It's fun to hear from someone from Finland - my ancestry is a tiny bit Finnish, though mainly Swedish and Norwegian. I used to love rising early ~ and then I became pregnant and wow... I haven't been able to sleep straight through the night for the past five months! So when my husband gets up to make his morning rounds I stay in bed for another half-hour and he comes and wakes me. It's the only way I can stay awake for the morning before I need an afternoon nap! I always thought I was one tough lady... until I became pregnant hahahaha! With every woman it is different and with this baby at least, I feel like a human slug! No early mornings for me these days! "It's fun to hear from someone from Finland - my ancestry is a tiny bit Finnish, though mainly Swedish and Norwegian." Really? I didn't know :) But then again, I should have guessed it from your last name. Actually I found your blog when I was searching information of modest dressing. And this went straight away to my bookmarks. I'm going to keep on commenting with my not-so-fluent English. Glad to hear that I'm not the only night owl. It is around 11 pm here, I just came from work and I still have to take dogs out for a walk and after that take a shower and read some christian literature. (I have found my faith again recently and I am strengthening it bit by a bit). What an inspiring post this has been to me! I struggle with this so much. I homeschool my two girls and so during our school year I like to get up between 6:30 and 7:00. However now that we have taken a summer break I am getting very lazy and not gettin gup until about 9! Ugh that is so bad! One thing that is difficult for me as well is that my husband owns his own buiness and therefor sometimes gets to sleep in on mornings when he has no accounts scheduled. It is so hard for me to get myself up when he is still laying there. He likes when I sleep in with him but then it throws my whole goal and schedule off. I have got to get better with this. This is my usual routine through the year. The first thing I do in the morning is wash my face and brush my teeth. Then I put on a pot of coffee, unload the dishwasher, get the girls up and make breakfast. I shower while they eat and then we all sit down for devotions and Bible reading before we begin any other school work. This really helps to keep our focus. I don't really stay up late but I love to read. I try to read my Bible and other christian or inspirational books before bed, then I pray and sleep. Anyway I am glad I found your blog! It's a survey that guys of all ages filled in. It has really been a blessing to me! Actually the 2 guys that started this are the brothers of a pastor from one of my sister churches. I hope that it will be able to answer some of your questions, God bless. Thank you all for your comments! It's fun to hear from each person about their schedules. Coffee Catholic: Being pregnant would, I'm sure, change a lot! You need lots of rest for your health and that of your baby! Mirka: I'm glad you plan to come back! Italian Girl: Glad you had a good, early day! =) And yes, the modesty survey is good! •When do you usually try to get up? Or, what is your ideal rising time? •What do you do to make yourself get out of bed? •How do you make yourself stay awake? Now that's hard for me! We pray every morning though, and sing, so that wakes me up some...brushing my teeth really helps, and washing my face. •Do you have a morning routine? Does it help? No I don't! I can't get into a routine in the morning...my brain just doesn't work as well.